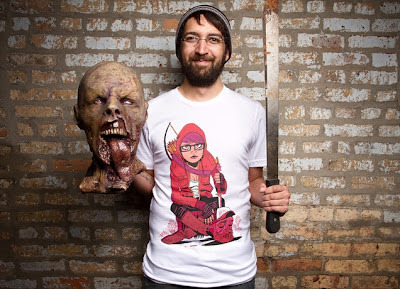 « Nike "True Colors – USA Track & Field"
Threadless always has great product shots, and this one for “Zombie Survivalist” is no exception. It’s available in guys and girls cuts, and also as a hoodie. The artwork is by Dan Hipp, who has done work for Cartoon Network, Real Simple, Wired, DC Comics, Image Comics, and Random House. You can view more of his amazing illustrations on his blog, Mr Hipp.